So, I’m home sick (a very RARE occasion for me); and I’m bumming around with both my new Unibody MacBook (review still pending…) and my MSI Wind U100 running a triple boot configuration of Ubuntu 9.04 (very awesome, by the way…), Windows 7 RC1 (comments pending…) and OSX 10.5.6. I always check Software Update when ever I am on the OSX side of my computers, and while the check on the MacBook detected nothing earlier this morning, this afternoon on the Wind, I was greeted with this interesting site. 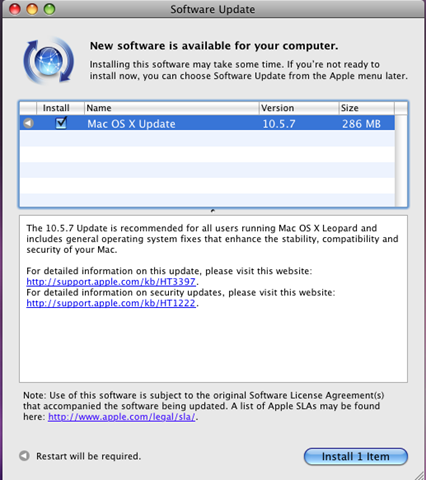 Leopard Update 10.5.7 has been released, and is available for your general OSX goodness. Update: The 10.5.7 Update installs just fine on the Wind. The keyboard and trackpad work even after the install, unlike the 10.5.6 update. However, video is reduced to 800×600 resolution; and installing the first of 3 video KEXT files kills the Wind’s display. The Wind reboots and gets stuck on the gray Apple logo screen, with the mouse arrow active. Letting the Wind sit and think turns the arrow into the spinning beach ball, where it sat for about 45 minutes before I killed power to the Wind. Looks like I have to either rebuild the OSX partition and/or the whole 3x boot box (if the individual OSX rebuild fails to return the PC to its full triple boot functionality). Improves reliability when automatically syncing with MobileMe. As with ANY Software Update, you’re encouraged to backup your Mac before you install this or any software update. According to my install screen, my Wind is showing the update at 286MB. Your download size may vary; and as always, while this is an Apple recommended update, you are cautioned about applying this or any update to your system.